We accidentally stole a dinosaur from the hairdresser. Somehow, we wound up celebrating the dino's birthday at dinner (please note the delicious cake). He got his own piece of pizza as well. JEALOUS of our stellar parenting skills? i WOULD judge...but i fed my ten month old cheese pizza last night. 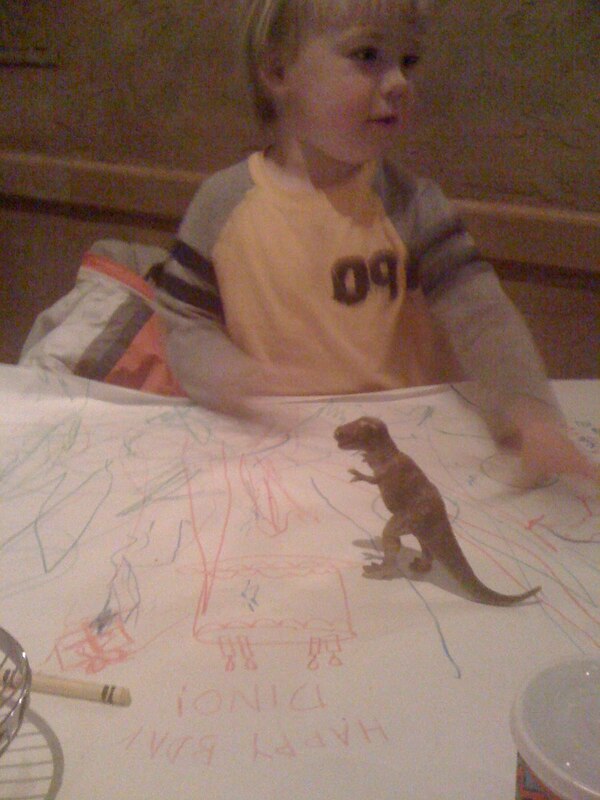 and besides...you taught thinking of others (it was rexy's party afterall), AND sharing your dinner. i'd say you're WAAAY ahead of me! Accidental theft is a necessary part of parenting...as is cheese pizza, butcher paper tablecloths, and dinosaur birthdays. I love it. I love this! Keep up the great work (as parents). hahaha! Love it. And I love the title.